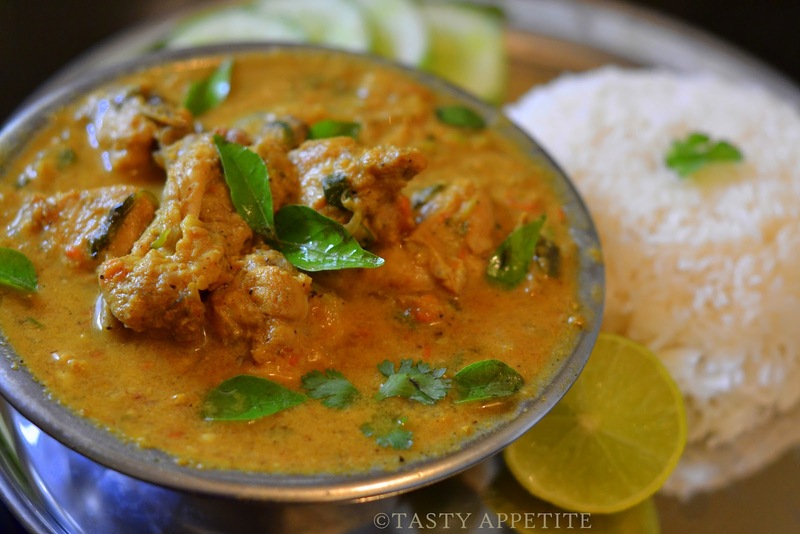 Here’s a spicy & aromatic Chettinad style Chicken curry recipe. It is so easy to cook & is also one of the tastiest.! In this recipe the chicken is marinated with chilly pwd, turmeric pwd, herbs paste and cooked in spicy masala. For best result, do start earlier to allow time for marinating the chicken pieces. And it goes great with plain boiled rice or with chapatis ( Indian flatbread ) . Clean and wash the chicken pieces. Wash and grind mint, curry & coriander leaves to fine paste. Add this paste to chicken. Add salt, turmeric pwd, red chilly pwd, ginger garlic paste and combine. Meanwhile heat a tsp of oil in a pan. Add mustard, red chilly and coriander seeds. Allow to cool & grind it to coarse masala pwd. Make a paste of grated coconut with the addition of little milk. Now heat 2 tbsp of oil in a fry pan. Sauté til it turns light golden brown. Add green chillies slit lengthwise and sauté further. Add mashed tomatoes and cook till oil separates. Add coconut paste in the pan. Fry well in medium flame for about 2 to 3 mins. Cover and cook in low medium flame till the chicken is cooked tender. No need to add water, as the water content in the coconut paste is enough to cook. Allow to cook for 2 more mins. Add little water according to your desired curry consistency. 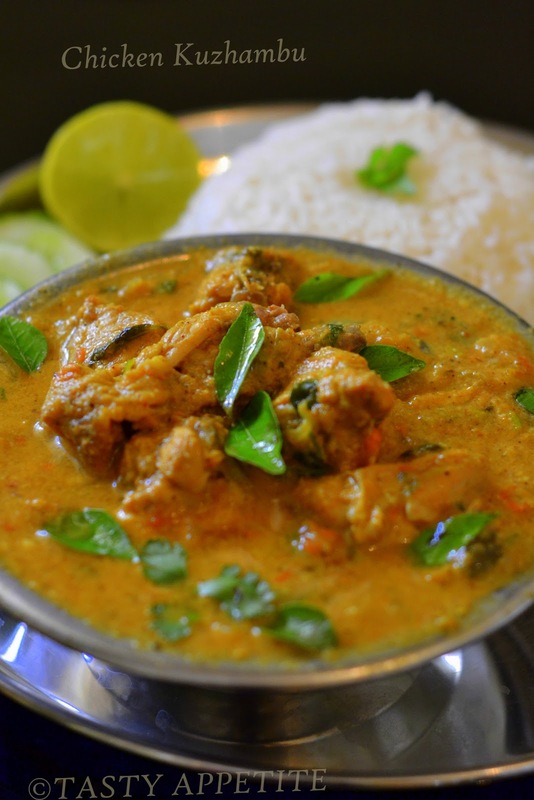 The delicious chicken kuzhambu is ready. Serve hot in a bowl & sprinkle few drops of lemon juice to it. 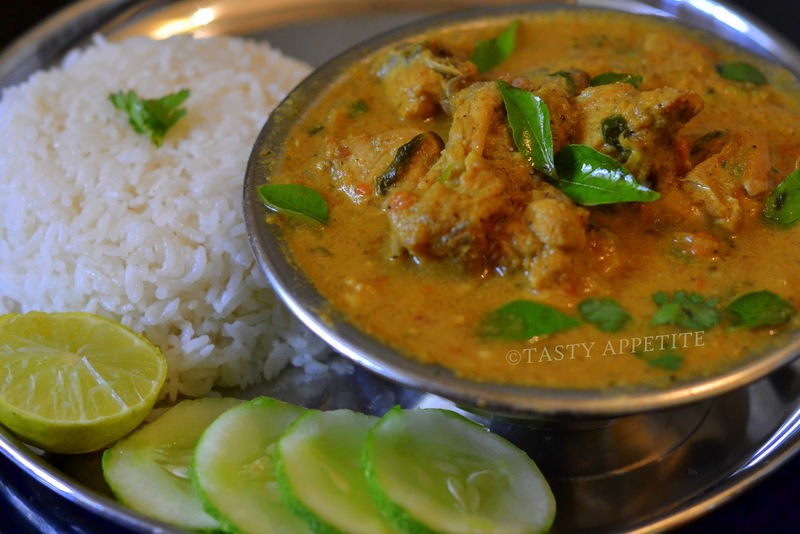 It makes a lipsmacking combo with steamed rice or with roti / chapatti. it looks delicious and comforting! yum yum! the much awaited post has come..
looks very tempting..drooling over the pics..yum yum! I will have second helpings if get some of your curry. It looks very very delicious! I have to try it! such mouthwatering dish n pic....!!! wow very impressive...n nice..luv it! That spicy sauce sounds super delicious! thank you for your wonderful comments.. Absolutely delicious!! Have a great Sunday! such a droolworthy recipe,looks very tasty!! Very tempting clicks Jay, looks delicious!!! Es una verdadera tentación me encanta luce bellísima,abrazos hugs,hugs. Loveliest dear...I just cooked some chicken perattal...pass me this dish pleaseeeeeee! chicken kuzhambu sounds so yummy...am drolling over your pics...too tempting Jay! Hi! Lovely photos! I love any spicy Indian chicken curry...this one looks really good. looks absolutely delicious.. love chettinad style recipes. :) I still have to try that chettinad chicken you made... I just need to buy Organic chicken.. and everytime I go to TJ's or Whole Foods, I end up going to dinner and the chicken may go bad. ;) Very soon I will! so yummy and appealing chicken !! wonderful one !! 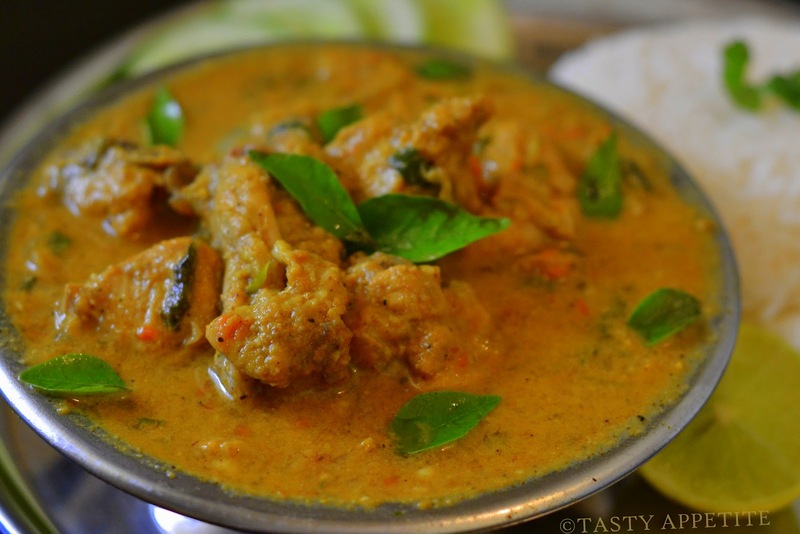 Definitely a fingerlicking and droolworthy chicken kuzhambu. Your blog is accepted in the INDIA section in a minute! I feel like sinking my teeth on this bowl of curry. Looks spicy and delicious! Have a great week! very very yummy...following your space.. do stop by mine.. I love spicy curries... sigh am waiting to cook non veg! I've got tons of mint growing in my garden, so I think I've just found a new use for it! Good recipe, good post - thanks. Love this spicy chicken. I'm going to try it! Jay ... You have been nominated for my NEW Food Stories Award for Excellence in Storytelling. Check out my site for the details (foodstoriesblog dot com). Curry looks finger licking good. Yum I'm going to have to try this because I love cooking with lots of spices. So spicy and delicious looking! This spicy chicken looks just awesome!!!! That looks like a cracker of a dish Jay! so very tempting Jay..chicken is a favourite at my place and so this is on my to try list:) thks for sharing the delicious recipe. This looks beautiful and delicious! I can imagine how tasty it must be with the rice. 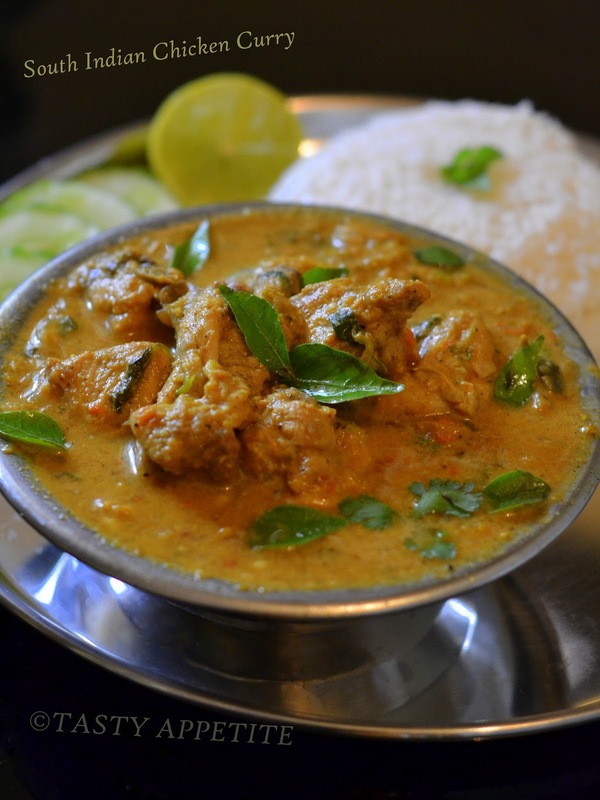 Delicious looking chicken kuzhambu n mouthwatering presentation. Hi Jay chicken looks super yummy. there is an award waiting for you please click the below link and accept the award. When it comes to non veg chettinad cuisine is the best. Thanx for the share. So tempting & finger licking good!! !